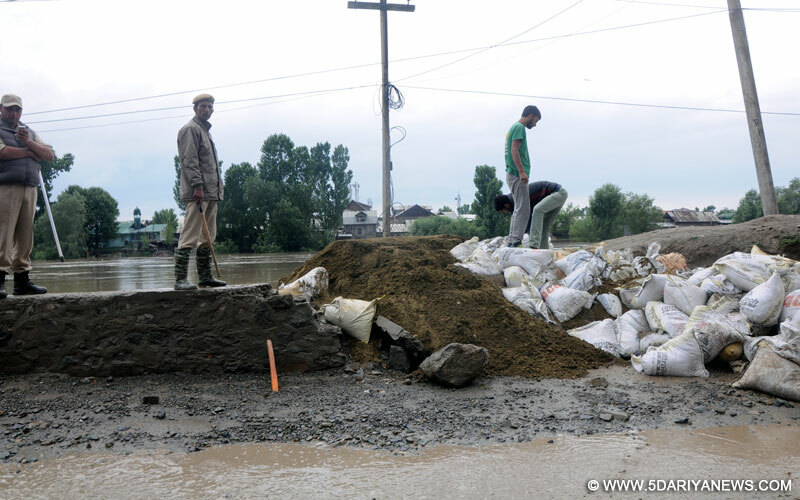 Kashmiri people known for the hospitality, Wednesday night not only rescued the trapped CRPF personnel from flood hit Qaimou Kulgam area but also took them along in their houses and served them as a host serves to his guest.Eyewitnesses told CNS that a group of CRPF personnel from 18 Battalion were on way to their came when the flood waters stalled the movement of their vehicle. The group of CRPF personnel got trapped in flood water and due to damage caused to bridge, they couldn’t proceed towards their destination.Scores of people came to their help and rescued them from the flood waters. We provided them clothes, food and arranged bedding facilities for them. They stayed whole night at a residential house,” said a group of people. Eyewitnesses said that on Friday morning, large contingent of CRPF personnel arrived at Qaimou while some personnel used life-saving jackets and water tubes to help their colleagues to evacuate from the flood hit area.“We are very grateful to the people who not only rescued us but also served us. They are humane and benevolent,” said a CRPF man to CNS.